Feburary 2015 – Concurrent Technologies today announced AG A1x/m1d, a new AdvancedMC® module (AMC) for High Performance Embedded Computing (HPEC) applications based on multiple NVIDIA® Tegra® K1 mobile processors that use the same NVIDIA Kepler™ GPU core designed into supercomputers around the world. AG A1x/m1d is fitted with either two or four Tegra K1 processors, each of which is powered 192 Kepler™ CUDA® GPU cores and 4-Plus-1™ quad-core ARM® Cortex®-A15 CPU, offering a maximum performance per module of 1.3 TFLOPS in a format roughly the size of a postcard and with a typical power consumption of less than 40W. 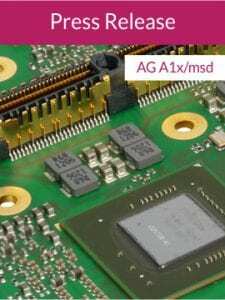 AG A1x/m1d is designed to be compatible with existing Concurrent Technologies’ Intel® processor based AMCs giving embedded system integrators the flexibility to build heterogeneous systems using combinations of modules to suit their application. Typical embedded applications include video transcoding, image analysis and recognition, high speed physics experiments, wireless test, simulations and encryption/decryption where size, modularity, environmental requirements and power consumption make it impractical to use standard server based equipment. AG A1x/m1d modules are architected to enable larger clusters to be created easily via the low latency RapidIO® fabric. Concurrent Technologies offers a solution called Fabric Interconnect Networking Software (FIN-S) across its range of AMCs including AG A1x/m1d that allows any socket based Linux application to utilise the RapidIO fabric. This allows the solution to benefit from the low latency and scalability of the underlying RapidIO fabric without implication at the application level. “Many of our customers need supercomputer performance in the size of a shoe box that is suitable for their embedded applications. This module enables us to provide significantly higher compute densities in heterogeneous solutions with our existing AMC product range. It enables our customers to swiftly create a range of security, image analysis and simulation products by using combinations of our modules”. “Our Tegra K1 mobile processor and Jetson TK1 development kit are designed for high-performance, low-power embedded systems. Concurrent Technologies’ AdvancedMC module is an ideal showcase for the Tegra K1, offering embedded developers a multi-core, scalable solution based on an open and modular standard”. “This GPGPU AMC module is another example of where RapidIO is used as a unified fabric for performance critical computing. The GPGPU AMC leverages the low latency and scalability attributes that have made RapidIO the de-facto fabric for use in wireless basestation implementations to create an innovative, modular solution for High Performance Embedded Computing”.